These are Quirky’s Pivot Power and Pivot Power Mini. Why We Love It: Quirky has developed two simple and elegant solutions to overcrowded outlets. Quirky Pivot Power first came out two years ago, and was even a Red Dot Award Winner in 2012. 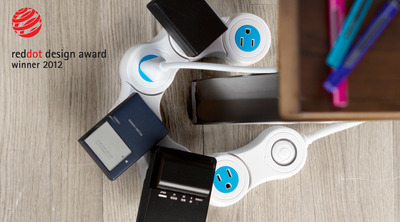 It’s a flexible surge-protected, multi-power outlet station with six places to plug in electronics. But more than that, the shape can be conformed to your room and furniture, and allows large power bricks to plug in without hogging any space. 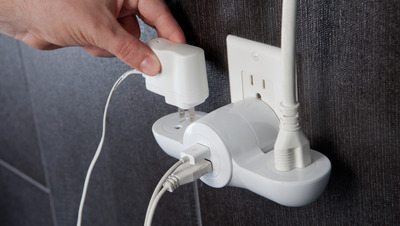 Meanwhile, the Pivot Power Mini is the perfect surge-protected wall adaptor for travellers. With just one plug, you can charge two USB cords, two three-prong plugs, and have room for the upper plug to remain free. Where To Buy: Available through Amazon here and here, as well as through Quirky’s website. Cost: $29.99 for the Flexible Power Strip, and $24.99 for the mini.